How do you get 7000 people to unite against two of the biggest countries in Europe? Try to build coal mines on their homes. I recently joined nearly 7000 others from across Europe to make a ‘human chain’ between the two villages of Kerkwitz, Germany and Grabice, Poland. This Human Chain was assembled to protest the coal industry (brown, lignite coal in particular) that is putting both of these localities at risk of being demolished. Currently a new Vattenfall mine in Germany and PGE mine in Poland are both in the planning phases and if approved would displace 20 villages and their 6000 inhabitants. The event was put together by a host of national European branches of environmental organizations like Greenpeace, Friends of the Earth, Naturefriends, etc. The aim was to send a signal to the German and Polish governments that the energy future the people wanted did not include coal. And frankly that the people of Kerkwitz and Grabice didn’t appreciate the idea of having their homes relocated and communities destroyed. It can be difficult to imagine the action of some citizens on an overcast Saturday afternoon will revolutionize how Europe produces energy. Yet despite these doubts, the action managed to rally up over 7,000 people from across Europe. As I traveled with a group of Czechs to join the action, we actually drove through the former coal region of the Czech Republic itself- northern Bohemia. It’s a part of the country that foreigners such as myself rarely visit due to a bad reputation. It has one of the highest unemployment rates in the country and most of the other nasty side effects that come with that- higher crime rates, less education opportunities, high levels of xenophobia, and marginalization of minorities. This region has had a problematic history since World War II when it’s German population was expelled as a consequence of the Nazi occupation of Czechoslovakia. There it remained abandoned and underdeveloped until the communist government came in to make way for new coal mines to be built in the region. Thus this region became one of the coal centers of Czechoslovakia- keeping people busy with work and fueling the burgeoning heavy industry. It remained like this until the fall of communism where the new capitalist market economy didn’t leave space for the heavy industry approach that the communist, centrally planned economies had built. Therefore the need for coal plants dropped significantly and has trickled out ever since. Today the high unemployment of the area is problematic and is the target of several current EU development projects. During the bus ride to the action, we watched a documentary on the destruction of Most, a town located in Northern Bohemia. In 1964 the old historic center of the town was demolished by the communist Czechoslovakian government in order to make way for lignite coal mines. We saw centuries old buildings fall to dust to make way for massive open-pit brown coal mines and communist style panel housing for it’s workers. This story is remembered as one of the tragedies of communist Czechoslovakia and played as role in the democratization in the 1989’s as many Czechs felt that the communist government did not care about it’s citizens or environment. So as we sat on the bus to join the action, watching this video seemed like a nightmare that only could’ve happened in the Cold War fueled industrialization of communist Czechoslovakia. Then almost better than road signs, the increase of wind turbines dotting the roadways was a clear sign that we had entered Germany. It then struck me- isn’t Germany supposed to be the example of a clean energy future in Europe? So why were we going to Germany to protest the coal industry? Whereas Poland (the other target of the action) is the self-proclaimed defender of coal in Europe, Germany is the country that is genuinely revolutionizing the way Europe produces its energy. Nevertheless, we have recently seen a comeback of coal in Germany. This comeback is due to a mix of reasons- coal being really cheap and natural gas not so much, a weak EU Emissions Trading System which isn’t giving anyone much incentive to keep their emissions down, and an aging set of subsidies that keep the real cost of coal to the governments and away from the consumers. How did coal get so cheap? The US is in the midst of a fracking frenzy- the process of fracturing the earth in order to release natural gas. This is allowing the US to shift much of their energy consumption to natural gas and freeing up their coal supplies to be shipped off to the EU. This is a major explanation as to how the US has been able to lower their CO2 emissions, which is good for their national climate reputation. Add on the fact that much of Europe’s natural gas comes from Russia, the country that is at historically tense levels with the EU, and you have a perfect storm of conditions for the coal industry to reinsert itself into relevancy in the European energy plans. Why does the EU ETS matter? The EU ETS is Europe’s cap and trade system, the largest in the world, that hypothetically should encourage countries to curb their emissions by putting a price on them. Every country is given a certain allowed amount, if they go under, they can sell off their remaining amount of permissions and if they go over, they have to buy extra allowances. Problem is, since the economic crisis has pushed industrial production levels down and the renewables sector has taken off unexpectedly well, most countries have more credits than they know what to do with. This makes the incentive to cut down on emissions low. Therefore if coal and paying for their emissions is so cheap- countries have little financial motivation to use cleaner energy sources. Who is subsidizing what and why? Germany is one of many countries that subsidize the financing of coal, despite the repeated calls to do otherwise from nearly every international organization on the books. As the coal industry once was a booming industry in Germany and still has some political weight within Berlin, decades old subsidies are still in place that keep the price of coal down for consumers and producers alike, putting the burden on the state’s shoulders. This makes much of the real cost of coal invisible to the market and industry. This includes externalities such as the health effects of air pollution, the costs of climate change, and the financing of an industry that relies on a resources that is certainly finite and increasingly having to be imported. As we reached Kerkwitz and joined the rest of the participants, there was little doubt in most of our minds about why we were there. It wasn’t just a rally of environmentalists who hated any kind of development and were looking for any excuse to protest. While it is true that from an environmental and climate change perspective, coal is as bad as an energy resource as one can find. But I began to see that it was even simpler than the enviro-economic reasons I had joined for. This fight was about helping the people of Kerkwitz and Grabice whose homes, way of life, and cultural heritage were at risk- all for a form of energy that they knew could be replaced by cleaner alternatives. History has shown us the toll the coal industry can take on an area. It’s a finite resource and once those resources are used, thousands of former miners are without jobs and the country without energy. The switch to renewable energy isn’t only about cleaning up the atmosphere and preventing climate change- it’s a matter of basic economics. The human chain ended with a series of concerts at a former border crossing in Poland. Despite being cold and rather gray, the energy leftover from the action helped keep spirits high and people happy. Even being just meters away from German territory and all but only technically in Poland, it was a reminder that this issue is transnational. Whereas Germany gets almost 30% of it’s energy from renewables, Poland will struggle to reach the 15% renewable target for 2020 mandated the EU. Poland produces nearly 90% of it’s electricity from coal. Thus it is obvious how the coal industry in Poland is so powerful- the country cannot exist without it. The nickname Coaland didn’t come about for nothing. The historical legacy of coal in Poland is stronger than it’s Czech and German neighbors. One reason for this is that it is the only of the three countries that does not have any nuclear power reactors. A proposed Polish nuclear industry was abandoned after the Chernobyl disaster in 1986, unsurprisingly given it’s proximity. The lack of nuclear power would thus leave only renewables, coal and natural gas to fuel this country of 40 million. As Poland doesn’t have much natural gas on it’s own, it would need to import most of it from Russia- which is nearly politically impossible given Polish and Russian historical relations. This leaves the country with the option of either renewables or coal. Yet renewables have yet to gain broad traction within Poland. The German Energiewende has failed to make a favorable impression and is often given a negative tone in Polish media. Being hailed as everything from expensive, unrealistic, impractical, and pushy, the German renewable boom is not highly regarded by either the Polish press or politicians, thus leaving the general public to follow suit. Germany is the biggest economy in Europe and the sixth biggest in the world. Poland is a smaller player in the global economy but it is becoming an increasingly powerful force within the EU. It’s size alone gives it weight within the EU power structure and has the potential to push EU energy policy in it’s direction. Furthermore, recently former Polish Prime Minister Donald Tusk was named the President of the EU, a move that some have claimed to be the ‘most powerful position a Pole has held since Pope John Paul II’. Today the country argues that coal allows Poland to be ‘self sufficient’ for it’s energy needs- yet last year saw that Poland has begun to import it’s hard coal from abroad. This makes the Polish coal energy independence argument not the reality anymore. Perhaps this could turn more of the Polish public to rally for more domestically created energy such as renewables. Maybe some wind turbines off the coast of Gdansk or some solar panels in the vast Polish countryside aren’t such a bad idea? Germany and Poland will not have the same energy path, that’s clear to see. If the thing that connects these two visions is only a human chain created by people, so be it. It’s a powerful thing that people came together to unite against something they see as being inherently bad and it’s the will of citizens who take their time to tell policy makers what kind of energy future they want to see. Whether or not they will listen, we will have to wait and see. But if we can get a few more people thinking about what is behind the light switch they turn on, maybe the governments will as well. 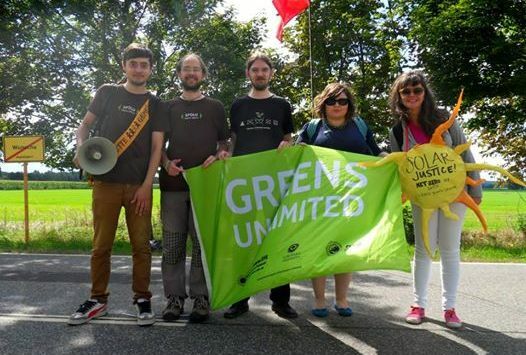 Tagged coal, Coaland, Czech Republic, Energiewende, EU ETS, Germany, human chain, Poland. Bookmark the permalink.